Gift Rap Video Slot Guide & Review - Casino Answers! Gift Rap is a 5-reel, 25-line video slot developed by Microgaming, featuring a wild symbol, scatter wins and a bonus game. You can play the Gift Rap video slot at Bovada. Coin values on the Gift Rap slot machine are $0.01, $0.02, $0.05, $0.10, $0.20, $0.25 and $0.50. 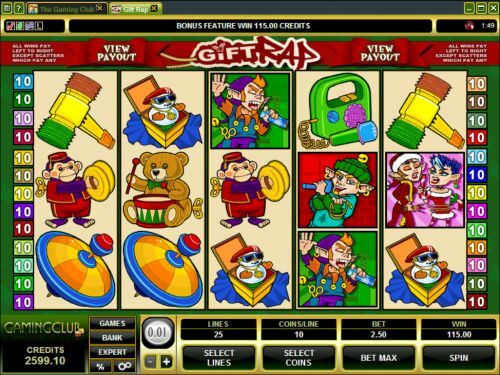 You can select from 1-25 paylines on a spin and 1-10 coins per line on the Gift Rap slot game. You can bet as little as one cent on the Gift Rap penny slot up to the maximum total bet of $125. Gift Rap offers a good betting range for both casual players and high rollers. Play the Gift Rap online slot game by selecting your bet and pressing the “Spin” button. You can also play the maximum bet (25 lines) by pressing the “Bet Max” button to spin the reels. The highest paying symbol is the Bauble symbol. 5 Bauble symbols on a selected payline and you will win the 6000 coin top jackpot. The Bauble is a wild symbol and will substitute for all symbols except for the scatter and bonus symbols. The next highest paying symbols on the Gift Rap slot game are the Singing Elves, which will pay out 1000 and 8000 coins respectively. You can win up to 60,000 coins using the Bauble wild symbol when you play Gift Rap at Bovada! The scatter symbol on Gift Rap is the Scatter Spray. 3, 4 or 5 Scatter Spray symbols anywhere on the reels of the Gift Rap slot machine and you will win 5X, 20X or 80X your total bet. When 3 or more Rappin’ Jack Frost bonus symbols appear on the reels, you will trigger the Gift Grab bonus game. The Gift Grab bonus game consists of a 5X6 grid of gifts. You will pick gifts until Rappin’ Jack Frost tells you to stop. Bonus wins are added to payline wins. Wins shown in the bonus game have been multiplied by the total bet. You can win up to 32,250 coins by playing the Gift Grab bonus game on the Gift Rap video slot. All wins are multiplied by the bet per line, except for scatter wins. All wins pay left to right, except for scatter symbols (which pay any). Scatter wins are multiplied by the total bet. Scatter wins are added to payline wins. Only the highest win is paid per selected payline. To use the autoplay mode on the Gift Raps online slot machine, you must hit the “Expert” button. You can now play 5 or 10 autoplay spins. For advanced settings, hit the “AutoPlay” button and you can now play 5, 10, 25, 50, 100, 250 or 500 autoplay spins and stop autoplay if a win exceeds or equals $100, $500, $1000, $5000 or $999. Autoplay will stop on any feature contained in the game. You can stop autoplay at any time. For those who are looking for an X-Mas themed video slot, Gift Rap is a video slot you may be interested in. Its bonus game is simple, but it can lead to some big winnings, thus complexity no longer seems as important. It also has a decent top payout. The concept of the slot is humourous enough, but it could be executed better if the video slot was a little more recent. To play the Gift Rap video slot, make a deposit and play today at Bovada! Can American players play the Gift Rap video slot for real money? Players based in the USA cannot play the Gift Rap online slot for real money at this time. 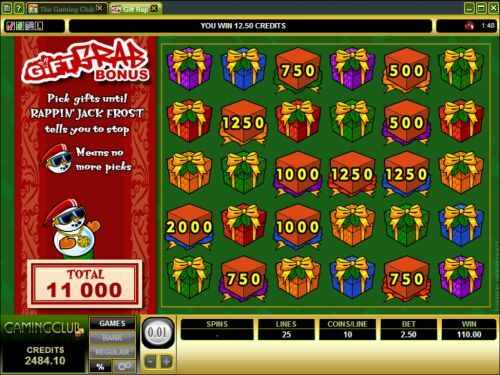 For several different X-Mas video slots, we recommend you visit the USA-friendly RTG casinos Bovada. Where can I play a free Flash game of the Gift Rap video slot? You can find an Instant Play version of Gift Rap in your browser with no download required at Bovada. You can play for real money or you can play it for free in practice mode. If you have any difficulties playing at the Instant Play casino, we suggest updating your version of Adobe Flash Player.